In just the short space of two weeks, Team GDW would embark once more on a road trip to Canada that offered up plenty of déjà vu. Not only retracing our travels to the same eastern side of Toronto, we would find ourselves back at Robinson Hall, the venue that hosted our previous event with Madison Violet. Seeing some familiar faces once more, one patron even recalled that we were from PA and was grateful that we had returned again to support the Acoustic Harvest concert series. 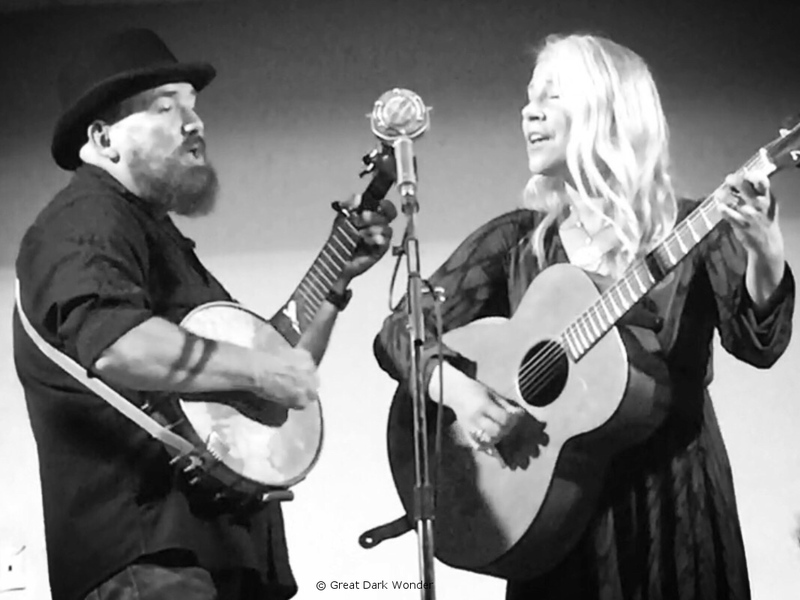 Last November, L would encounter the debut album from Alberta based folk/swing duo Over The Moon, and promptly posted a review to share their amazing brand of music. Incredibly excited about this husband and wife duo of Craig Bignell and Suzanne Levesque, we quickly added them to our ‘wish list’ of artists to try and catch once they made their way into the Eastern provinces or US states. With the eventual tour dates announced, we were a little disheartened to find none that fit into our travelling schedule. Even a date in upstate New York happened to clash with another commitment. 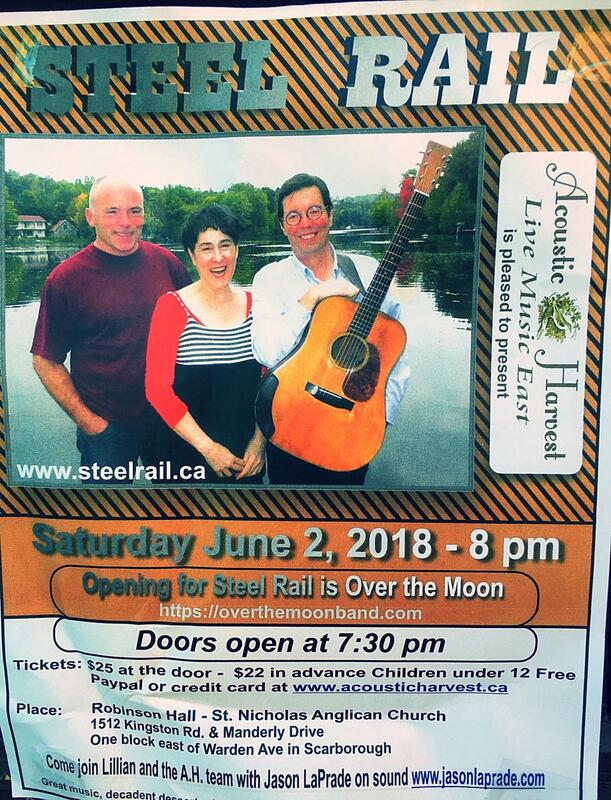 So imagine our delight when L discovered that Over The Moon had been added as the opening act with the Montreal based band Steel Rail for this particular weekend at Robinson Hall. Tickets were quickly secured on the strength of Over The Moon’s music alone. 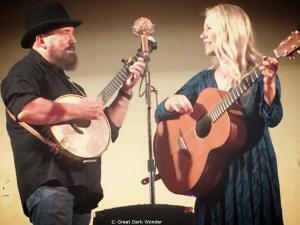 As a touring married couple, the natural chemistry between both artists shone all evening. No conversations seem scripted or rehearsed; they simply bounced off each other with ease. As the seemingly more vocal of the duo, Craig easily painted himself as a natural and gifted storyteller, spinning tales with ease about life back home in Longview, AB. Not to be outdone, Suzanne offered the perfect counterpunch, keeping Craig in check with some witty one liners and expressions of her own. Both clearly thrived under the spotlights, adding not only a sense of honesty, but of creating the illusion of being in a room with good friends, as opposed to an opening act that was there solely to play a few tunes. And having the opportunity to chat with the duo after their set, we really did feel that we’d spent time with friends that we’d known forever. With their next album currently in the works, we remain confident that future opportunities will arise to catch Craig and Suzanne in person once more and share more of their wonderful folk-roots music. With our continual growth in exposure to Canadian music, there are still many bands out there with whom we are completely unfamiliar. We must confess that we’d not heard of Steel Rail prior to this show. As mentioned, we were here primarily to catch Over The Moon, but having struck up conversations with many of the patrons in attendance both on this night and our previous visit, the band came very highly recommended. 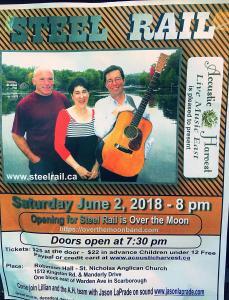 We soon learned that Steel Rail were a folk band based out of Quebec, and whose recent number of live shows have been both sparse and sporadic. Taking the stage immediately after Over The Moon made their exit, we settled in once more to experience another band for the first time. All three members of the band would admit that they were a little rusty, with some occasional amp and instrument technicalities, along with some uncertainty over which key they were playing in (Todd was changing some up on the fly due to his vocal cords not being 100%). Ever the professionals, however, the trio could share in the amusement of these miscues, and turned the musical key issues into an ongoing joke for the evening. “What key shall we play this one in, Todd?” asked Dave, eliciting laughter from the audience, whose feedback both encouraged and kept Steel Rail ‘on track’ (couldn’t resist the blatant pun). Mixing up their original material with some other popular covers, we were treated to great renditions of “Red Dirt Girl” (Emmylou Harris) and “I Just Wanna Dance With You” (John Prine, and popularized by George Strait). 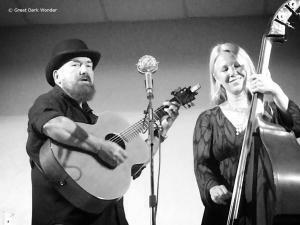 While Todd handled the majority of the lead vocals, Ellen offered up a couple of numbers, introducing one of her tunes as “a love song written for people of a certain age.” And during the technical difficulties with her bass amp, both Todd and Dave would banish ‘dead air’ with an impromptu few lines from “Ghost In This House;” at least until the bass amp was co-operating once more. 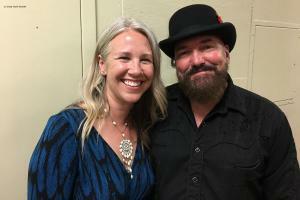 Setting all vocals aside for one track, Dave would introduce the track “Wild Rose,” an instrumental piece inspired by the official flower of Alberta, and dedicated to his wife Lucinda. Closing their second and final set with “Big Sky Blues,” Steel Rail received a standing ovation from a highly energetic room full of people. 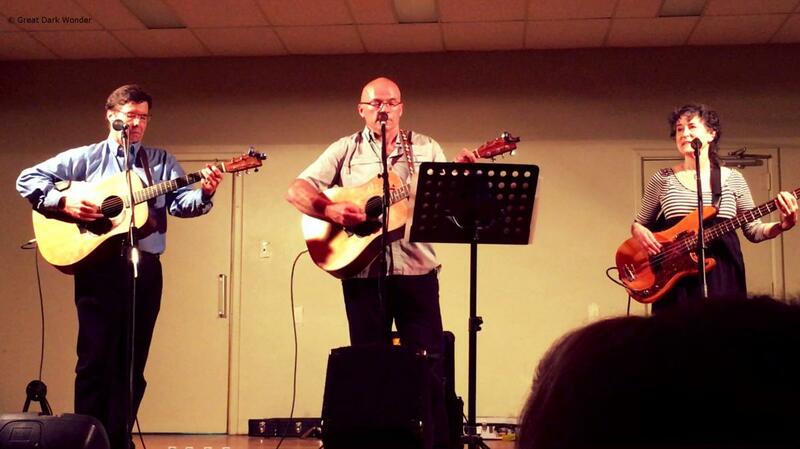 The trio would return the gratitude with one more song, and closed the show with a gospel flavored track that brought out their amazing three-piece harmonies and instrumentation for one last number. With a few more shows in the pipeline, and a new album on the way, Steel Rail have indeed returned, and are ready to share their wonderful music and personalities with you. Visit Over the Moon’s website.